So Topps Valor wasn't a "one and done" after all. 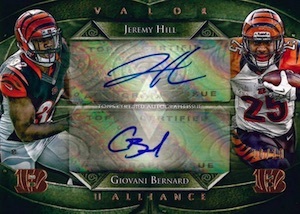 After skipping last season, 2014 Topps Valor Football marks the brand's return. When it debuted in 2012, Valor was a late-season release that was quickly overshadowed by high-end heavyweights like National Treasures and Five Star. The revamped product comes back much earlier in the season, although still with its focus on battlefield virtues and gridiron heroics. Every box promises an autographed memorabilia card, a second autograph, a patch card and a jumbo relic. Leading the hits are Shield of Honor Autograph Patch cards. Subjects feature rookies, veterans and retired players. Rather than traditional color parallels, Valor uses virtues. For these inserts, this translates into Speed (#/99), Strength (#/75), Courage (#/50), Discipline (#/25) and Heart (1/1). Like Shield of Honor, basic autographs use stickers for autographs. The checklist is somewhat large with more than 40 players. Parallels match up with the themes and numbers from Shield of Honor. Alliance Autographs have two (#/10), three (#/10) and four (#/5) signatures from teammates. Both the one-per-box Patch cards and Jumbo Relics are numbered. Jumbo Relics use a similar approach as those from 2013 Topps Supreme. The memorabilia piece is layered underneath a die-cut player image. Rather than traditional color parallels, Valor uses virtues. Shield of Honor, Autographs, Jumbo Relics and Patch cards all have Speed (#/99), Strength (#/75), Courage (#/50), Discipline (#/25) and Heart (1/1) parallels. 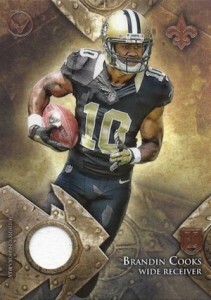 2014 Topps Valor Football has a 200-card base set that mixes rookies, veterans and retired players. Parallels include Speed (one per hobby pack), Strength (#/499), Courage (#/399), Discipline (#/299), Glory (#/199), Valor (#/99) and Heart (1/1). 2014 Topps Valor Zach Mettenberger Rookie Auto Patch PSA graded 8 Card. 2014 Topps Valor FB #VP-ME Mike Evans Tampa Bay Buccaneers PATCH RELIC RC # 99 ! Good: Distinct look, four hits. Bad: Sticker autographs, plain parallels are overdone, base hits not numbered, no inserts. The Bottom Line: If you like colorful backgrounds and large team logos then Valor is a good place to start. However, outside of the four guaranteed hits, the product itself is very simple with only base and parallels. This makes for an rather uneventful break and without any big value hits to pull, Valor will not likely have much staying power. The 2014 Topps Valor base design has gone through some tweaking since it was last seen in 2012. I find the new design to be solid and it has a little more personality than the "scorched-earth" design from 2012. The smokey bottom gives way to large, rippling logo background that corresponds to the player. All things considered, I felt the design was vibrant enough to catch the eye, but it was not overwhelming. However, I could see how collectors might find it somewhat busy. The copper foil finish on the “V” and “RC” logos adds a touch of class. On the negative side, the base stock was quite thin and I did see several bent corners straight from the pack. The base parallels are another story. With one unnumbered “Speed” parallel per pack and several more numbered parallels per box, they quickly felt overdone to me. The difference is very slight and only includes a subtle cloud color change and faint text to indicate the specific parallel. Since there are no inserts, the only other cards are the hits. I did find it odd that there were 20 packs, each with six cards, and there were no other card options besides base, base parallels and hits. The relics and autographed relics feature very thick stock but it was a little disappointing to see the small, penny-sized relic pieces. The patch relic I pulled would have looked very nice signed on-card in silver. The main autographs were basically just the base card with a sticker autograph. The only design that stood out among the guaranteed hits was the jumbo relic. Assuming it is not two pieces, the visible jersey piece was roughly two inches by three inches, which is quite large. Even though it was a plain piece of jersey, it was still impressive. Some collectors may not like that the middle of the jersey is obscured by a die-cut player image, but without it, it would have been tough to include the player in a way that did not feel forced in the corner. Maybe an acetate die-cut image would have been a nice compromise. Heavy on rookies and younger players, the checklist is fairly comprehensive. While that extends to the autographs and relics, Valor is not really the best place to look for autographs from established veterans. Valor is one of the only sets this year that did not go with short prints, but maybe it would have worked better here given the lack of inserts. The sticker autographs are not great, but the main rookies are all available which will help interest as long as the class does well. With value, it always boils down to rarity and quality. Hits are guaranteed in Valor, but they feature sticker autographs and mostly tiny relic pieces. It is tough to pull value from this formula. Given the contents of the box, the price versus value is not terrible. The more unique box layout might make for a more appealing break if you don’t like inserts but still want a good supply of base along with your hits. Outside of that, the price still seems a bit high. Even with the large number of parallels and expanded format, Valor felt a tad one-note. The subtle parallels were easy to lump with the base cards, so the only cards that stood out at all were the hits. That only applies to four packs and the remaining 16 were just not that exciting. These look nice. I liked 2012 Valor and these look even better. I’ll definitely give these a try. Avoiding these for now. Looks boring and Panini Prizm is cheaper and probably better value. 4 HITS AT A GREAT PRICE POINT. So Topps Mega Boxes are out which have 2 Hobby Packs of Valor. Ended up buying 3 of these and hit an Andre Williams Auto, Nick Foles Jumbo Relic Discipline /25, and an AJ McCarron Shield of Honor Discipline Patch/Auto /25. The base cards are of thinner stock than 2012 but do look real nice. Just found some retail packs at Target. As far as I can tell the only difference is the stock being even thinner than the hobby. Beautiful looking cards! Colorful- and so different from the drab other products. Only complaint I have is very thin card stock! Better produces to get. This mostly comes with small relics and the same players over and over again. Love the product this year only question I have is are there actual variations to the Rookie Relics Set? I don’t see them listed here but I have seen a few of them popping up on eBay. JRED1983 � I’m not seeing any relic variations for the rookies. Can you point me to a specific example of what you are seeing? 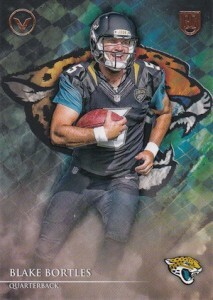 I recall the elegance of 2012 Topps Valor, Topps continues the quality product in a very consistent manner. This set has a almost artistic graphic stylization comparable to Inception. If you’re an fan of Inception, this set will not disappoint. 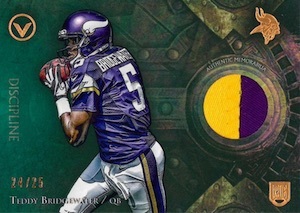 I’m shocked yet very pleased that Topps has chosen to release Valor as a Retail product. This gives young collectors and collectors on a budget unlike myself to acquire some really great examples of 2014 Topps Valor. 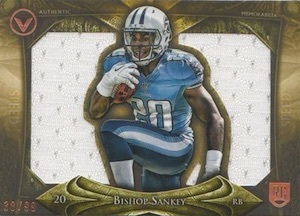 Great design combined with a decent draft class, I’m very sure that this up coming collecting season will inspire collectors to get excited in 2014 products! Missing many big name Vets on relics/autos. No Manning, Rodgers, Brady, Kaepernick, Gore, Rivers etc. I will pass on this. Maybe I’m just having bad luck with this product but I haven’t pulled anything that has really wowed me. The autos and relics I’ve pulled have been base or numbered pretty high. The cards themselves look good but I just don’t see the value being there after two hobby boxes and countless packs. I really like the potential of this product. 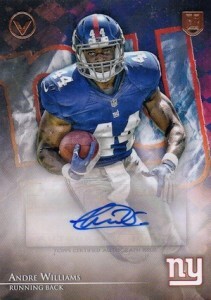 Love the base cards but the parallels just don’t cut it. Needs some type of insert as well that could work off the names of the parallels. Also the autos should be on card with the look of the card. Tweek it some Topps and I’ll give it 5 stars.